Assuming your residence is not directly below a giant rock…you know that Apple has recently announced many exciting new endeavors, including Apple TV+, Apple News+, Apple Arcade and (of course) Apple Card. Any Apple announcement is a big deal, which is why I dedicated an entire episode to all the Apple Announcements on the podcast. Because I know Apple Card is a gigantic deal for all the financial institutions out there (read: many of my clients and friends) there was a particular focus on that in the episode. However, your business can and should learn these three things from the Apple Announcements. So, here’s the deal. There isn’t much that is particularly unique about Apple Card. At the end of the day, it is still a credit card. And, the “no fees ever” are made up in interest rates (including a penalty interest rate which is yet to be released by Apple). This is common, expected, and something any financial institution could have done in the past (or could go do tomorrow). The thing Apple did that you should learn from, is they stepped outside of the traditional offering, listened to what people wanted…and then actually incorporated it into their product and the way they framed their messaging (novel, I know). When you work in a particular industry, you tend to get too close to the topic at hand. I am willing to bet there is no one working at a credit union or bank who would be shocked to learn that people don’t like fees. They’ve had the research and have been talking about this for years. But, they were also too close to “the way things have always been done” to completely separate from the herd and remove all the fees. Why is that? Our brains rely on biases and rules of thumb all the time to make decisions. If you aren’t careful, even when you think you are being open minded and evaluating the research…you are still coming from a biased subconscious that influences all your decisions. This allows space for disruptors (in this case, Apple) to come in and do what you should (and could) have done years ago…and win. I still remember a presentation from Jeff Charney I attended at Content Marketing World back in 2014 (fantastic presenter – if you ever get the chance to see him…do it). Jeff, who is the genius behind both Flo from Progressive and the Aflac Duck, said he “fires himself” every 18-24 months. He then approaches his job and role as if he were a brand new employee and looks at all the things he can and would change. Those fresh eyes can often be the reset your brain needs to help you reframe the message/product/pricing/whatever to keep moving forward. Since the episode aired last week, the insights into anticipation and expectation have generated the most comments about from listeners. This concept’s counter-intuitive nature is what makes it so interesting. People have been complaining about the Apple announcements coming before there was anything to release (mostly because this is different from what Apple has done in the past). In reality, this is a genius move on Apple’s part because of the way anticipation actually works in the brain. It all starts with dopamine. A light comes on, notifying a monkey that if it presses a lever 10 times it will get a treat (which it knows from past experience). While the monkey is eating the treat? When the treat is released? While the monkey is pushing the lever? When the light comes on? If you are like the scientists who conducted the study, you probably thought the reward would come with the treat. After all…it is the thing you think you want. After all, it is why the monkey is pushing the lever at all…right? Well, it turns out the dopamine release (what the brain really wants) starts the moment the light comes on and it peaks while pressing the lever. And it stops…when the treat is released! That means the brain’s reward is for the anticipation and not the treat itself. What do you think happened when the result became more unexpected? Instead of getting the treat 100% of the time, they changed it to 50% of the time. This seems like it would be frustrating for the monkey and it might give up. But you know where this is going, right? The dopamine release doubled! More anticipation = more rewards for the brain. That means, creating anticipation for products and announcing them before they are available is a great thing for brands. People will be thinking, talking and looking for Apple’s new services, generating rewards for their brains. The problem with most credit cards (and loyalty programs in general) is their rewards are delayed way, way too far from the behavior a company is trying to encourage. Perhaps you get a monthly or quarterly statement with a points balance. Or worse – are expected to log into a completely separate system to check your balance whenever you remember to do so. This is not as effective because humans are much more motivated by losses than gains. If you do want a lasting benefit and the ability to create a habit, you need dopamine release, anticipation and immediacy (see above). If your customers are not anticipating the treat (points, cash back, whatever) there will be no dopamine released. No habit. No lasting benefits. Just costs for you. Apple clearly realized this, and chose immediate cash rewards. They are tied to the action they want repeated (use the card) and get a higher payout for things they want encouraged (use Apple Pay/buy Apple products). Smart. 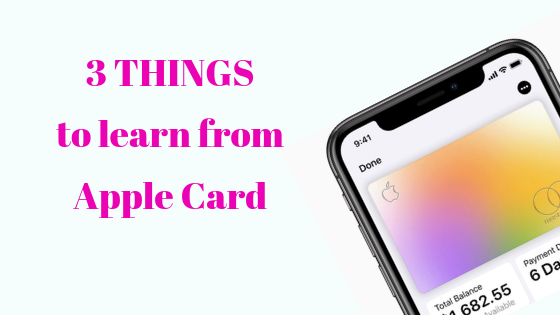 I hope you enjoyed this little taste of the analysis into what your business can learn from Apple Card. For all the juicy tips (and many more about all the Apple announcements) listen to the full episode. Now it’s your turn. What is your company going to do to incorporate framing, anticipation, expectations, and immediacy? Share in the comments. Or, let me know on Twitter or Facebook. And as always, BE thoughtful.